The global production of aluminum in 2018 was 64.34 milltion tonnes. Incredibly, that actually represents a slower growth than in previous years however it is up 1.5% from the previous year. When taken into context, aluminum has been by far the metal that is most in demand when compared to all the other metals that are mined and produced by the world’s manufacturing and industrial economies such as China, the United States and Canada. By far the top producer of aluminum is China. In fact, China has been the top producer of aluminum for a number of years. According to world-aluminum statistics, China’s estimated production of the metal is 2,780 million tons. This is compared with 296 milltion tonnes in the US and Canada. The size of the chinese aluminum machine is quite large when compared with the rest of the world. That is expected to continue for the forseeable future as China continues to expand aluminium production capacity. Tariffs that have been intrudced in the US and Canada with the aim of protecting local manufacturing and aluminum extrusion industries. They have to a certain extent succeeded in keeping factories from migrating overseas, especially to China. However, in Canada, the production of aluminum was estimated at 3.2 million tonnes in 2017, which has been fairly steady over the past decade. 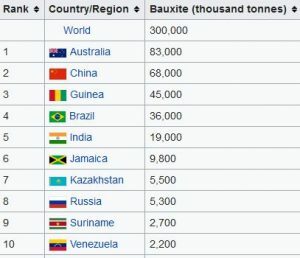 When it comes to bauxite ore production, Australia is the leader in this field with total capacity of approximately 83 million tonnes, followed closely by China. However, due to import and export feasability and cost of production variations, it is surprising that Australia is not the top producer of aluminum. As the world aluminum demand increases, the pressure on ore and ore pricing can come into effect over the next decade. What that does to the price of aluminum of world markets is not quite certain. Canada is surprisingly among the top countries that produce aluminum, coming in third place with 3.21 million tonnes after Russia who produced 3.6 million tonnes. The Canadian economy is quite strong when it comes to aluminum production and extrusion with a number of companies based in Ontario including Signature Aluminum (http://signaturealum.com). The size of the industry has been on the up in recent years, even though it was slightly affected by the tariffs issues with the United States. Wraping up the top 5 is India and UAE who produced 3.2 and 2.6 milltion tonnes respectively. Overall, the world production of this useful metal has been on the rise, not just for the qualities that it brings to the manufacturing world, but also because of its ease of extrusion and forming into many types of everyday material. Trivia: Did you know Aluminum is the metal most used in manufuring windows? There has been much debate in the industry recently about which metal is the hardest out there. Some people attest that it is steel, while others prefer aluminum. As proponents of the aluminum front, we believe that aluminium is not only one of the hardest metals available for industry, it is also the most versatile! The fact is, there are stronger and harder metals than aluminum out there. However, the versatility of aluminum makes it the most famous and most valuable of all the metals out there. The economics of it also plays a great deal because it can be produced at prices that are not too exuberant, and are well within the reach of most manufacturers and extruders. Perhaps that is the reason we are seeing this metal make significant inroads in all industries. For example AA 6063 is an aluminium alloy is one variation that exhibits distinct hardness qualities that are of use to many people in the industry. It also happens to be the most common alloy used in the extrusion process. So if you’re looking for a clean cut answer, sorry! You must take into consideration many factors, not just the hardness of the metal. Diamonds are the hardest material, but is it economical to make airplanes out of diamonds?